Friar Laurence comes forward and sings directly to the audience, encouraging us in our lives to follow the path of reconciliation, too. This is Berlioz's message for the play, and the music and voices swell, even with an orchestra of seven and a cast of 13. 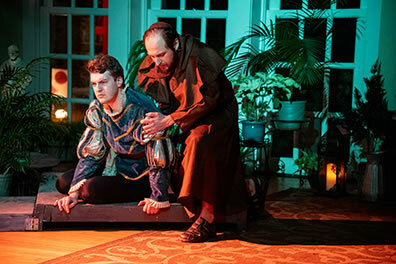 Romeo (David Schoonover, left) is comforted by Friar Laurence (Ian Pomerantz) in the Shakespeare Opera Theatre's production of William Shakespeare's and Hector Berlioz's Romeo and Juliet. Below, Juliet (Elle Marie Sullivan) talks with Lady Capulet (Barbara LeMay). Photos by Kenneth Garrett, Shakespeare Opera Theatre. The power of the pedigrees is beyond question: playwright William Shakespeare and composer Hector Berlioz, together in one shared piece of work, Romeo and Juliet. Throw into the equation the Shakespeare Opera Theatre, a small company in Northern Virginia that, since its founding in 2015 by opera singer, arranger, and conductor Lori Lind, has successfully paired Shakespeare's plays with the musical works they inspired. Of course I'm going to see this. This time, however, Lind may have bitten off a bit more than she could chew, not for lack of skill or will but because the two beasts she tries to tether together are too titanic in themselves to play nice with each other. We end up with half a good thing paired with half of another good thing, adding up to something less than the sum of its parts. Not until the final scene, when one piece of art gets nudged aside and the other is allowed to fully flourish, does the production take flight, and that 15-minute finale alone makes worthwhile my trek to Grace the Plains, the Grace Episcopal Church in The Plains, a rural community 50 miles west of Washington, D.C.
After a nomadic existence in its first three seasons, Shakespeare Opera Theatre has settled into Grace the Plains, using the church's fellowship hall as a naturally immersive play space. The room has a peaked, wood-timbered ceiling with lanterns hanging down, tall, glass patio doors on one side, stained-glass windows on the other, and a huge fireplace on one wall below a large balcony. The hall has a raised stage, but it's behind us as Lind uses every inch of the rest of the room as the stage for this production. Thirty-two seats for the audience are set diagonally in the middle of the room, the orchestra is to the left under the stained-glass windows, and Friar Laurence's cell (with tables of flowers) is to the right. Next to Laurence's set is a bilevel structure of bare wood platforms that serves as the marketplace and Capulet's monument while the fireplace serves as the backdrop to domestic scenes and the balcony serves as the balcony. The characters are costumed in traditional Renaissance clothes, colorful doublets and hose for the men and tapestried gowns for the women. Lind, who helmed this production and served as musical arranger along with the conductor, Lisa Bloy, comes to the task well-credentialed. Her company debuted by pairing Shakespeare's Much Ado About Nothing with Berlioz's Béatrice et Bénédict and followed the next year with The Merry Wives of Windsor and Giuseppe Verdi's Falstaff. In 2017 she decided to do one production instead of two by interweaving Felix Mendelssohn's Midsummer Night's Dream Overture and incidental music into Shakespeare's play. The musical DNA has always been the stronger strand in this company's theatrical genes, with high-quality vocal performances and small orchestral ensembles that sound bigger than their numbers. The Shakespeare is less expertly delivered, yet the plays always manage to inspire and surprise thanks to the musical pairings and outstanding individual performances. A Midsummer Night's Dream especially illustrated how Shakespeare informed Mendelssohn, whose composition then informed the play. The title of Mendelssohn's composition hints at why that production worked so much better than this one: A Midsummer Night's Dream Incidental Music. Berlioz's Roméo et Juliette is a self-contained symphony. It features soloists and chorale, but the composition, Berlioz adamantly stressed, was not an opera and not intended to be performed or received as such. He is musically telling the tale. Though Mercutio, Friar Laurence, and a narrator have singing parts, and the chorale serves as Capulets and Montagues, orchestral passages provide much of the narrative and represent the title characters. Berlioz wanted to expand the symphonic formula, to out-Beethoven Beethoven's Ninth Symphony. He threw all his creative idiosyncrasies into the piece, blending various orchestral formats and going big. In addition to a chorale and parts for mezzo-soprano, tenor, and bass-baritone, Roméo et Juliette supplements a full orchestra with two timpani and two harps (having written a score for two harps, Berlioz doesn't even include them at all in the last of the piece's three parts). This production's eight-piece orchestra uses one harp (Zoe Coppola) along with a cello, flute, clarinet, oboe, bassoon, and two violins, with concertmaster Drew Robertson doubling on viola. As a symphony not intended for stage music, the score explodes at times in brass and percussion, and Lind's necessary edits lose some of the idiosyncratic majesty that distinguishes this piece (and Berlioz in general). We still get some delectable musical moments, such as clarinetist Terri Smith's solemn solo over cellist Joan Burdette's underscore as Juliet mourns over Romeo's body, and other key musical interludes that come to the fore in the drama. Otherwise, Berlioz is relegated to serving as melodic incidental music during overlong scene changes. Shakespeare gets slighted, too. That begins with Berlioz himself. The composer loved the Bard and was so moved by an 1827 production of Romeo and Juliet in Paris that he fell in love with and ultimately married the actress playing Juliet, Harriet Smithson (a relationship that inspired Berlioz's masterpiece, Symphonie Fantastique, which contains contextual matter from Shakespeare's play). The Romeo and Juliet that Berlioz saw was David Garrick's version, and while the plot tracks closely to Shakespeare's, Garrick compressed some of the action, muted the poetic imagery, and, most famously, had Juliet wake up before Romeo succumbed to the poison, a drug that didn't have the alacrity of Shakespeare's version. Berlioz drafted a libretto based on Garrick, and Emile Deschamps completed it. The symphony excises the nurse and significantly expands the theme of reconciliation that Shakespeare covers in 10 lines. Plot sequences are out of order, and the Montagues and Capulets brawl after the lovers' deaths before Friar Laurence explains everything. We get not one but two Queen Mab moments. A soloist sings a version of the speech during Part One (Introduction and Prologue). Then the orchestra sans voice closes out Part Two with the Queen Mab Scherzo, representing the dreamlike state of requited love. Lind uses Shakespeare's original text, but in trimming the play to make way for Berlioz's proportion and get the run time down to 2:30 with a 20-minute intermission, Lind follows the libretto's lead in excising Nurse's role in the play. Nurse (Helen Woodson) is used only in crowd scenes and to assist with props during scene changes, including meticulously making Juliet's bed as Berlioz plays. Her only textual contribution is a few lines intervening in Capulet's wrath when Juliet (Elle Marie Sullivan) refuses to marry Paris. All mention of Rosaline, Romeo's first love, is gone, too. In the absence of Nurse and Rosaline (though the latter never actually appears in the play), we realize just how key both roles are to the plot and to some of Shakespeare's most important passages. With no Nurse to tell Juliet of Romeo slaying Tybalt, Juliet begins Act III, Scene 2, by running onto the balcony some 60 lines into the scene, yelling at herself about torment and storms. This means her "Gallop apace, you fiery-footed steeds" soliloquy has been entirely cut, which I was hoping to hear Sullivan deliver. With no Nurse to identify Romeo to Juliet in the masque, we get the strangest Montague exit I've yet seen. Mercutio (James Brown) suddenly removes his mask to reveal who he is and runs out laughing. The other Montagues, including Romeo, follow suit, having triumphantly punked the Capulets. This doesn't mesh with the gentlemanly Romeo that Lord Capulet has just described, but it allows Juliet to identify the masked boy she danced with and kissed. As Romeo runs away, Sullivan steps into the commotion's wake and says, "My only love sprung from my only hate!" And this is a guy to pine for and pursue? Sullivan starts off presenting a whip-smart, self-assured Juliet. In meeting Romeo at the masque and in the balcony scene, she takes the lead in seducing the morose, dull-spirited Romeo as played by David Schoonover. As the play progresses, Sullivan's Juliet grows younger and starts personifying a young tween girl. She gives a giggling shrug in the wedding; she's the one who demanded it, but Romeo is the one taking it seriously. She also can't grasp the gravity of the morning-after scene as Romeo heads off to banishment. The lark is all a lark to her, and she responds to Romeo's "Let me be ta'en, let me be put to death" as teasing repartee. By this point, my mind has reversed: what does Romeo see in her? He has grown up significantly in the intervening scenes as Schoonover hits his stride. He displays the attitude of a cold-blooded assassin when he takes on Tybalt after Mercutio's death, and in the subsequent scene in Friar Laurence's cell, Schoonover plays Romeo's anguish with impassioned but viable logic: "Heaven is here, where Juliet lives; and every cat and dog and little mouse, every unworthy thing, live here in heaven and may look on her; but Romeo may not" is delivered with a lawyer's precision. Schoonover gives a chilling performance after hearing of Juliet's death, interacting with Balthasar (Dylan Nohilly) and determining to visit the apothecary (the actual visit is cut) with steely, business-like efficiency. Approaching Juliet in the tomb (his killing Paris is cut), Schoonover speaks his lines in a distracted monotone, as if numb, already dead in his soul. The poison proves aggressively quick, causing him to bounce off a radiator, stumble across the platform, kneel down to kiss Juliet and then, violently gasping, kick back onto the bier opposite Juliet and down on the floor between them—impressive stunt work. Juliet awakes, sees her love, and with girlish gleeful expectation steps to him only to find him dead (her mourning prolonged by Berlioz's soulful take on this moment). She kneels on the bier opposite hers and stabs herself, dying as she reaches out toward Romeo's body. Most performances tend toward melodramatic stereotypes. Santiago Alfonzo Meza plays Tybalt with clownish rage, laughing as the servants brawl, making faces at the slightest irritant, and having conniption fits every time he sees or even thinks of a Montague. A nice touch is his relationship with Benvolio (Robert Austin Barker), a thorn in each others' side, but they each give the other his respectful due. Lord Capulet (Gene Allen) erupts with violence when Juliet says no to marrying Paris, shoving aside his wife, pushing Nurse into a chair, and throwing Juliet back and forth across her bed, dragging her by the hair, and even choking her. Paris (Chris Godfrey) shows a violent streak, too, forcefully kissing Juliet on the lips after she initially turns her cheek to his kiss when they meet at Friar Laurence's cell. Barker's Benvolio is an exception to the Veronese male population, not just a head-turner in looks but, in one of the production's most consistently solid character portrayals, a young man of pleasant confidence and authentic empathy. Brown plays Mercutio as a flamboyantly carefree gadfly, but what he most brings to the role is his countertenor voice. He segues smoothly from Shakespearean wit-slinging with Romeo into singing Berlioz's Queen Mab speech as the Capulet chorus up on the balcony provides the song's punctuations. Mercutio entices the reluctant Benvolio and Balthazar to mime out the behaviors of the speech's lover and soldier as he sings. Brown then eases from song's end to the speech's last line before Romeo stops him: "Peace, peace, Mercutio, peace! Thou talk'st of nothing." "True," Mercutio replies. "I talk of dreams," and Brown continues this passage with melancholic self-reflection as he describes dreams as "children of an idle brain, begot of nothing but vain fantasy, which is as thin of substance as the air and more inconstant than the wind." This is one of the moments when the music takes over the play. Another is the drawn-out wedding scene featuring mezzo-soprano Maggie Ramsey (who plays Prince Escalus) singing the symphony's love aria. Mezzo-soprano Barbara LeMay (Lady Capulet) does similar duty for the love scene, during which Romeo and Juliet stand by the meticulously made bed, goo-goo eye each other before he takes off his belt—that's as much disrobing as we get—and they kiss and kiss again and kiss some more and fall onto the bed and kiss and kiss and kiss and roll over and kiss and kiss and kiss some more and then get under the covers and fall asleep to wake up at the end of the aria. This scene took me back to my high school days and "making love" with my girlfriend in such age-appropriate manner (at least for a virgin teen in 1975), but my girlfriend and I didn't have a Berlioz soundtrack accompanying us. Ian Pomerantz plays Friar Laurence as a guilty thing, constantly sneaking around and looking over his shoulder. As the Capulets are leaving Juliet's funeral, Pomerantz's Friar lingers over the girl and smiles triumphantly: his plan is working! When he learns from Friar John (Nohilly) that his message didn't reach Romeo in Mantua, Laurence is so distraught he takes a swig of shrub: his plans have gone awry! It's an uneven performance this night, and yet I write this in my notes during the funeral: "Friar has a good voice." This is during the chorale, too, with the rest of the cast singing. With that bass-baritone voice, Pomerantz takes this production to its transcendent heights in the final scene as Lind turns the play totally over to Berlioz. The Capulets and Montagues gather at the monument, singing their consternation at finding the newly dead Juliet and dead Romeo lying near each other before Pomerantz arrives on the balcony to sing Friar Laurence's Recitative and Aria. The Friar then descends to lead the company in the Oath of Reconciliation, instructing them to individually kiss the cross, and enemies pair up as friends: the ladies Capulet and Montague (Melissa Chavez), the lords Capulet and Montague (Brown), Tybalt (though dead) and Benvolio, Nurse and Balthazar. At one point, Pomerantz's Friar Laurence comes forward and sings directly to the audience, encouraging us in our lives to follow the path of reconciliation, too. This is Berlioz's message for the play, and the music and voices swell, even with an orchestra of seven (the harp already absent) and a cast of 13 (the two title characters are still lying dead in the monument). As the symphony concludes, I am about to catapult out of my seat for a standing ovation, except that Ramsey's Escalus then speaks the play's benediction: "For never was a story of more woe, than this of Juliet and her Romeo." Shakespeare gets in the last word, but this production ultimately belongs to Berlioz and that gorgeous finale. Shakespeare Opera Theatre has consistently been at its best when the music is playing, and it is that element that sets its productions apart from any other Shakespearean theater I've experienced. That Verdi, Mendelssohn, and Berlioz take the spotlight in these performances is a true treasure. After all, Shakespeare inspired them to do these great works, and these great works return the favor in giving us inspirational Shakespeare.